A Fife businessman has been left GBP32,000 out of pocket after his recovery truck was deliberately targeted with a molotov cocktail. (C) DC ThomsonOwner of Bolts garage Bob Coote with the burnt out recovery truck. Bob Coote discovered vandals had set the lorry on fire using the petrol bomb as it sat in the yard of his Leven-based garage on October 12. The 69-year-old was left “numb” after discovering the vehicle’s burnt out shell and is offering a substantial reward for any information that can help trace the callous firebug responsible. Mr Coote, who has owned Bolts Garage for 29 years, said: “At approximately 3am, the truck was purposely set fire to. “They put a jar of petrol under the door with a bit of rag on it. “It wasn’t just a wee rag they’ve set on fire, it was a jar of petrol so they’ve done it on purpose – it can’t have been an accident. “They were picked up on CCTV running away from the truck and then later on Riverside Road. You can’t tell who they are because they were hooded up. “It was one guy, dressed all in black. The police came down and interviewed us, asking if we had upset anybody but we haven’t. 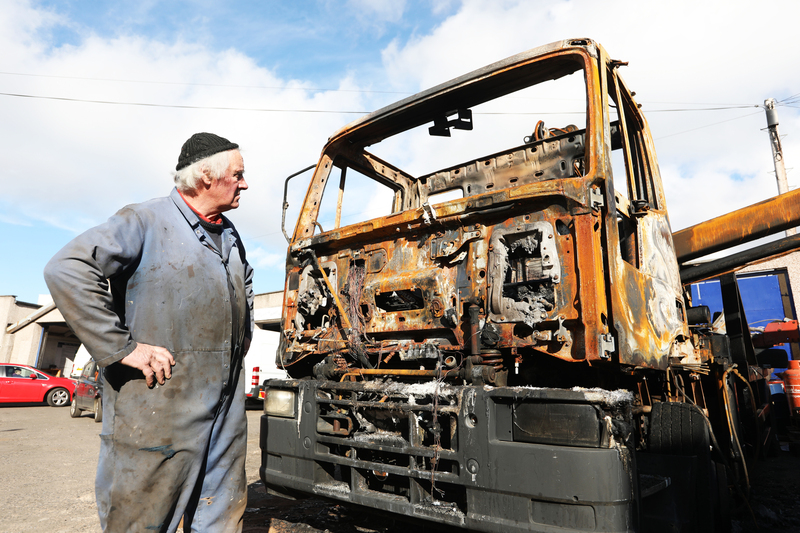 (C) DC ThomsonGarage owner Bob and Coote have hit out after a callous vandal set their GBP32k recovery lorry on fire. A second smaller truck, parked alongside the destroyed vehicle, was also slightly damaged. Mr Coote added: “It’s a vehicle recovery truck with a value of around GBP32,000 when we bought it. It wasn’t just an old rusty lorry or anything. “It was all purpose built and we were doing work on it at the time so it had a SORN notice and wasn’t insured. “We have two trucks in the fleet and the other one is a little bit damaged too but the big one is completely gutted. “There were a lot of customers cars out there at the time as well and I’m so glad the fire didn’t spread to the other vehicles. “I would offer a substantial reward for anybody that can help us with finding the person who did this to us. Police Scotland has launched a probe into the deliberate fire and are appealing for witnesses. A spokeswoman said: “Police in Fife are investigating following a report of a fire in Leven. “The incident happened at around 3am on Friday 12 October at a business premise in the Bridge Street area when a vehicle was deliberately set alight. “The Scottish Fire and Rescue Service attended and extinguished the flames.